The tables provide all the information needed to determine what each player wishes to build at each level. Column one gives the location. Column two names the item. Column three lists the specific materials required, though it should be noted that a saw and hammer are constant requirements and therefore are not listed in the tables. Also the number of nails given are the minimum required, though more should always be taken as they do break mid-construction. For those wishing to build everything in the table, there is a more extensive list of supplies provided underneath. This list also includes sundries, such as the saw, hammer and watering can (where applicable). Column four gives the experience per item, with a total at the bottom showing what the experience would be for all items made. Column five becomes extremely important as the cost of materials rises at higher levels. This states whether it is the highest level item to build in this hotspot. Players may wish to not build something if the item is pretty rather than practical (or vice versa) and an upgrade is due within few levels. In order to aid these decisions, also within this column are two figures: next upgrade level for this item/highest upgrade level for this item. Column six provides the approximate/actual cost of the materials, with a total at the bottom for those wishing to make all items. NB The cost of planks and nails is judged by the price at the sawmill, it does not take into consideration increased costs engendered by buying logs for making into planks, nor does it give the price of buying these things ready-made from other players. It should also be noted that those using Lunar Magic can create planks from logs much more cheaply by using the 'Plank Make' spell. Note: The amounts shown are based on the assumption that metal items, glass and clay will be player made and therefore free. Only materials that cannot be made, ie planks, stones, cloth, plants/trees and compulsory payments within the houses, are calculated. There are several plank respawns dotted throughout Runescape. One of the best is at the Barbarian Outpost, as four respawn a short distance from a bank deposit pillar. Use a games necklace to get there and save yourself a bit of money. Also, nails have a tendency to break; hence you should always pack more than you need. Bronze nails break more easily than rune nails. For each level, it is assumed that each item of furniture is being created in situ. For many hotspots, it is possible to add a flatpacked item regardless of your own level. For example, at level one, a player may buy a parlour for 1000gp. There is nothing stopping that player seeking the assistance of a higher level to make the highest level furniture for that room, or else buying them at the Grand Exchange. The same is true for all furniture in a player-owned house, as long as the item can be flat-packed and the player has the Construction level to build the room which accommodates it. Assistance can only be given in a player-owned workshop, not on the spot, and it cannot be given while a house is in building mode. For this reason, the assistance cannot be provided for rooms or plants. It should also be noted the supply list takes into account expenses incurred by also taking advantage of the options listed under 'notes' for each level. Read through 'The Basics', then visit any Estate Agent to buy your land for 1000gp. Your garden and the basic shell of your house comes 'free' with the 1000gp paid to the Estate Agent, however neither will have anything in them. A further 1000gp, paid by clicking on the door hotspot, will create a parlour and provide access to the chair hotspots. Your house can contain 20 rooms at this level. If you plant or build each of the available options at this level, you will already now be level 4 Construction. The crude wooden chairs may be sat upon. However doing anything whilst in your chair will cause your person to stand up. There is a common glitch here, whereby someone already sitting down will appear to be facing in the opposite direction to anyone else arriving later. The garden portal allows access in and out of your house. 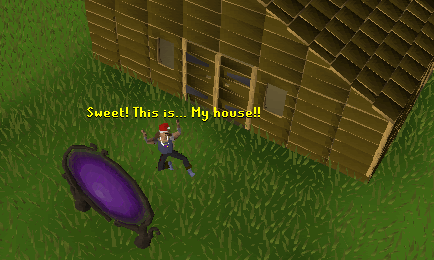 Others can enter your house by clicking on the portal outside and selecting 'friend's house', then entering your name. The house owner may deny access by either locking their portal or else setting their public chat to 'friends' (which would allow only those on their friends' list to enter) or 'off' (which would allow no access at all. No-one but the house owner may enter while in building mode. All plants, in this garden, are grown to be looked at. There is never a plant, fern or bush grown that can be picked. If you build all of the options for this level and level one, you will now be level 5 Construction. The torn curtains are purely decorative. They cannot be drawn nor used to make dresses. Using them on one window will result in all windows in that room being fitted with curtains. If you build this fireplace, you will still be level five construction. Extra xp can be gained by removing furniture already built and building it again on the same hotspot; alternatively, build the furniture available at levels 4 and 5. By placing a log inside your clay fireplace, a tinderbox can be used to light a roaring fire. Every book gained through a quest or random event will mysteriously materialize in your bookcase. This is true regardless of having destroyed the original and, in fact, any book taken off the bookshelves and lost will return intact to them. On the other hand, books not automatically appearing there cannot be stored here. Trying will simply cause you to lose your book. If you build this straight after building all of the lower level furniture, you will now be level six Construction. You can now build a kitchen for 5000gp. You now have the Construction skill requirement to do the quest, Darkness of Hallowvale. It awards 2k experience, as well as a tome of experience from which you can choose three skills to receive 2k xp each. If you choose Construction for all three, that is 8k xp in total. You also have the Construction level to do the Eyes of Glouphrie quest. One of the rewards is a crystal saw which, when used instead of a normal saw, allows you to build furniture three levels above your own. NB The saw does not allow you to add plants or create rooms above your level. The rock is merely decorative; as is the tree. The latter cannot be chopped down for logs, unfortunately. This applies to all future trees planted in this hotspot. In the kitchen, the firepit can be used to cook some items, though other foods will be dismissed with the message that they can't be cooked here. A kettle may certainly be boiled using it, but experimentation has shown that even low level fish and meat cannot be cooked here. A cat taken in the house, by either the owner or a friend, can be directed to go and curl up on the blanket. The wooden shelves 1, and all future shelves, are one of the more important items for the budding builder, because they are fundamental for a level boost. These shelves provide an inexhaustible supply of kettles, teapots and cups, which will be used in making a cup of tea. This boost will not be available until level 9. Though there are three hotspots, building in one will cause all three to be fitted with shelves. The pump and drain provides a source of water in the house, handy for filling the kettle, making soft clay and cooking. The beer barrel has an unlimited supply of beer on tap, though the player will have to bring their own beer glass to drink it. It raises strength levels by two levels, but lowers attack by four. Beer glasses filled in a player-owned house cannot be taken outside it. It can be bought in all pubs around Gielinor for 2-3gp. The wooden chairs may be sat upon. The wooden larder provides an inexhaustible supply of tea and milk. This is very important to the builder, as tea can be brewed to temporarily boost Construction levels. To make a cup of tea: take a kettle from the wooden shelves 1 and fill it at the pump and drain. Hang the kettle on the firepit, until it boils. Meanwhile, take a teapot from the shelves and add tea-leaves from the larder. Use the kettle, with its water boiled, on the teapot. This provides four helpings of tea. Use the teapot on the cup and drink. At this level, it causes a temporarily boost of one Construction level, which can be used to build furniture, but not rooms. Please note that tea cannot be taken out of the house. If using the boost to build future shelves, please ensure that you definitely have all of the materials in your inventory, as a visit to the bank will not only remove your tea but also the means to make it. In an emergency, switch out of building mode (the tea will survive) and ask a friend to bring materials, though they will have to step outside before you can create the shelves. Teapots filled with tea are tradeable inside the house, but cups of tea are not. You can now build a dining room for 5000gp. You also have the option to redecorate in the 'basic stone' design, as seen in Lumbridge buildings. This costs 5,000gp and can be bought from an Estate Agent. While you are there, you may wish to move your home. At this level, there is an option to move to Taverley for 5,000gp. This location is slightly closer to the Falador/Burthorpe banks than Rimmington is to Draynor/Falador. For those without the magic level to teleport everywhere, Taverley is also a better location. It's at the foot of Wolf Mountain and therefore not so much off the beaten track as Rimmington. You will now have the Construction level to do the Tower of Life quest. The rewards for completing it include 1000xp in Construction and a Construction outfit. Up to eight people can sit on the benches around the dining table. This use doesn't change, though the later dining table and benches became increasingly more elegant and expensive. The garden pond is merely decorative. In the kitchen, the firepit with hook can be used to cook some items, though other foods will be dismissed with the message that they can't be cooked there. The wooden shelves 2 provide an inexhaustible supply of kettles, teapots, cups and beer glasses. The tea from them still causes a temporary boost of one Construction level. Most items can be placed upon the wooden table, when not in building mode, but this abides by the same rule as dropping them on the floor. After a while, all items will disappear. Similarly, if you leave your house, the items will automatically disappear. If trying to place something on a table in a house belonging to a friend, a warning message will ask you if you are sure for this very reason, especially as a house owner could kick you out. The cider barrel has an unlimited supply of cider on tap, though beer glasses filled in a player-owned house cannot be taken outside it. Use the brewing guide for instructions on how to brew cider to build this barrel. It raises farming temporarily by one level, whilst reducing attack and strength by three levels. The rocking chairs may be sat upon, whereupon your person will be rocking. You can now build a workshop for 10,000gp. The tool store 1 provides an inexhaustible supply of saws, hammers, chisels and shears. No more long, dejected walks back to the bank for the builder who forgot their saw and hammer. Occasionally, during the stress of combat, arrows and staves can become bent or broken. The repair bench provides a place to fix them. The imp statue is merely decorative, but does include an animated water feature. The pluming stand, in the workshop, can be used to paint steel or rune full helms with family crest colors. Anyone can do this, using your pluming stand, though it should be noted that painted items become untradeable. Before colors can be painted, those requiring to do so first need to visit Sir Renitee, aka the herald in Falador. He will research your family history and provide the information for free; however, if you wish to belong to another family, he will change his mind for 500gp. Non-familial colors may be painted after visiting the herald under certain circumstances, for example, being skulled after a run to the Abyss will result in a skull design. Visit the Construction homepage for a full list. The crafting table can be used to make toy horsies. Just use a normal plank on the crafting table to create one, though level 10 crafting is required first. Additionally, the same procedure with the addition of a piece of fur, can be used to make wooden cats, as long as the player has completed The Great Brain Robbery quest. The oak decoration is purely decorative. The official guide will state that there are no wall decorations in the parlour, but there can be. The curtain hotspot allows for a wall decoration, if a connecting room does not also have curtain hotspots. In the kitchen, the firepit with pot can be used to cook some items, though other foods will be dismissed with the message that they can't be cooked here. The wooden workbench allows the builder to create flatpacked items up to level 20 Construction. Furniture made in this way can be carried outside of the house and traded, though not everything can be flatpacked. As the workbench can be used without building mode being switched on, this is the location where the 'assist' system may be used. Anyone can use this workbench, as long as they have access to the house. Though there is a limit on the Construction level items that can be made here, depending upon the quality of the workbench, flatpacked items can be erected by any level. For example, at level 17, you could buy or be traded a flatpacked mahogany armchair, which could be set up in the parlour. This is despite ordinarily requiring level 50 for that particular armchair. To make flatpacked furniture, simply carry all of the materials for that item, plus a saw and hammer, to the workbench and click on it. Select the furniture to be made from the catalogue which then appears. You will receive the same experience as you would if it had been made in a hotspot. To erect flatpacked furniture, use it on the relevant hotspot, whilst carrying the flatpacked item, a saw and a hammer. The curtains are purely decorative, though no longer torn like their predecessors. Using them on one window will result in all windows in that room being fitted with curtains. If a curtain hotspot exists on a connecting wall, without a window, there will appear a wooden decoration instead. The Asgarnian Ale barrel has an unlimited supply of Asgarnian Ale on tap, though beer glasses filled in a player-owned house cannot be taken outside it. Use the brewing guide for instructions on how to brew ale to build this barrel; alternatively, buy it in the pubs in either Falador or Burthorpe for 3gp each. It heals for 10 Life Points and temporarily increases strength by two levels, while reducing attack by four levels. The oak chairs may be sat upon. A cat taken in the house, by either the owner or a friend, can be directed to go and curl up in the cat basket. 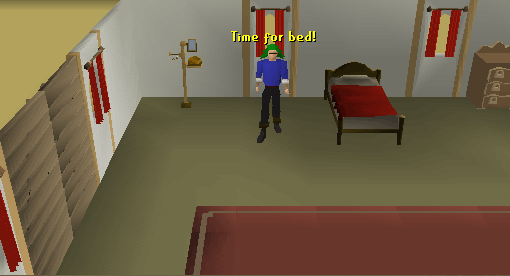 You can now build a bedroom for 10,000gp. You also have the option to redecorate in the 'whitewashed stone' design, as seen in Al-Kharid's buildings. This costs 7,500gp and can be bought from an Estate Agent. While you are there, you may wish to move your home. At this level, there is option to move to Pollnivneach for 7,500gp. For those with the magic level for 'home teleport', this will save on flying carpet costs, as well as being handy for access to the delights of the desert. 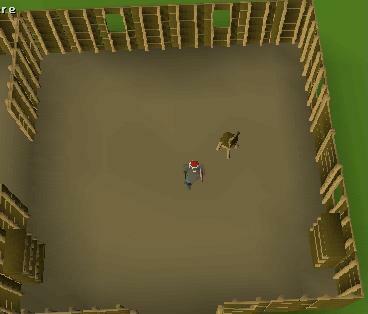 You now have the Construction level to do the Fremennik Isles quest. The rewards include 5k Construction xp. Finally, you have attained a level where you can hire a servant, Rick. The shoe box allows a free change of default shoes for any player with access to the house. Only male players can use the shaving stand. It does what it says on the packet, shaving off their facial hair. Up to eight people can sit on the benches around the oak dining table. This use doesn't change, though the later dining table and benches became increasingly more elegant and expensive. The wooden shelves 3 provide an inexhaustible supply of kettles, teapots, cups, beer glasses and cake tins. The tea from them causes a temporary boost of two Construction levels. In the kitchen, the small oven can be used to cook some items, though other foods will be dismissed with the message that they can't be cooked here. Frustratingly, given the now free supply of cake-tins and the ingredients to make one, the small oven will not cope with baking cakes. You can now build a Skill Hall for 15,000gp. You can hire a faster servant, the Maid. The tool store 2 provides an inexhaustible supply of buckets, spades and tinderboxes. It appears alongside the tool store 1, which does not need to be removed to accommodate this. The previous crafting table does not need to be removed in order to upgrade it to the second version. As well as retaining the ability to make wooden horsies and cats, this crafting table allows the creation of clockwork mechanisms, which are needed as materials in some furniture, notably clocks. Just use a steel bar on it, if you have level 8 crafting. In the bedroom, the oak clock actually keeps real world time, though only the minutes, with the hours denoted by the word 'rune'. For example, quarter to the hour would be 'quarter to rune'. The oak armchairs may be sat upon. The rope bell-pull is used to summon the servant, if one has been hired. This is useful as, though the servant will always remain on the same floor as the house owner, (s)he does move around and can be sometimes difficult to locate in a large house. The Greenman's Ale barrel has an unlimited supply of Greenman's Ale on tap, though beer glasses filled in a player-owned house cannot be taken outside it. Use the brewing guide for instructions on how to brew ale to build this barrel; alternatively, buy it from the pub in Yanille, Rasolo the wandering salesman near to the Baxtorian Falls or from the general store in the Lighthouse for 2gp. It raises herblore by one level, while also healing 10 Life Points. The oak staircase opens up the possibility of a second floor for your house. Unfortunately, it doesn't permit third or fourth floors, with the exception of the subterranean dungeon later on, so tower blocks are out. Ultimately, the four choices are: single level bungalow; single level bungalow with dungeon underneath; ground and first floor house, without a dungeon; or ground and first floor house with a dungeon underneath. At level 27, the decision is solely about the above ground aspect of your home. The pump and tub provides a source of water in the house, handy for filling the kettle, making soft clay and cooking. The oak drawers allow a free change of default shoes and/or hand type for any player with access to the house. There are two hotspots for armour, one holding Castle Wars armour and the other smithed armour. The items within or between each stand cannot be mixed and matched. For the former, the decorative helm, body and shield are all that is required. These can be bought with Castle Wars tokens, which are awarded as prizes for being on the winning side in that Activity. There are three different types, distinguished by the number of tokens used to buy them. Far more rounds of Castle Wars need to be won to buy the level 3 armour than are required for its level one counterpart. For the latter, the builder's smithing level is important. All variations call for a full helm, platebody and plateskirt. Though these items can be bought, rather than smithed, the stand can only be created with the requisite smithing level. Mithril armour can be used with level 68 smithing; adamant armour with level 88 smithing; and rune with 99 smithing. The armour stands have been cited as a good item for training Construction, as their experience/money ratio is very good. There is more experience gained per inventory here than with oak larders. The downside is that this method is clicking intensive and can quickly lead to the threat of a repetitive strain injury. The oak shaving stand offers a free choice of four beard types for male players, while female players receive a free choice of five hairstyles. In the kitchen, the large oven can be used to cook most, if not all, items. You can now build a Games Room for 25,000gp. The Hoop and Stick, in the Games Room, can be used for range experience. An unlimited number of players can compete at throwing the hoop at the stick, with a scoreboard recording the results for all to see. The winner is the first to throw ten hoops successfully over the sticks. Further details are available in the Games Book in your bookcase. You also have the option to redecorate in the Fremennik-style Wood' design, as seen, strangely enough, in Rellekka buildings. This costs 10,000gp and can be bought from an Estate Agent. While you are there, you may wish to move your home. At this level, there is an option to move it to Rellekka for 10,000gp. This is handy for the Northern areas, including Keldagrim and Trollheim, a short walk/climb to the east. This is also closer to Seers Village than Taverley was. You now have the Construction level to do The Great Brain Robbery quest. The rewards include 2000xp in Construction. You also may now be listed in the hiscores, which means that you can start using the Construction Calculator to assist in your planning. You can hire a faster servant, the Cook. Up to eight people can sit on the benches around the carved oak dining table. This use doesn't change, though the later dining table and benches became increasingly more elegant and expensive. An unlimited number of players can engage in boxing in the boxing ring, however they all need to strip off to their default clothing and be wielding no weapons. Even jewelry is taboo. The only required items are the boxing gloves, which are not available until the weapons rack is built at level 34 Construction. NB This is a safe area, insofar as dying will result in the player respawning somewhere in the house with all of their belongings intact. The oak workbench allows the builder to create flatpacked items up to level 40 Construction. Furniture made in this way can be carried outside of the house and traded, though not everything can be flatpacked. As the workbench can be used without building mode being switched on, this is the location where the 'assist' system may be used. Anyone can use this workbench, as long as they have access to the house. For more information about flatpacks, see the notes at level 17. A cat taken in the house, by either the owner or a friend, can be directed to go and curl up in the cat basket. The basket itself just looks a little grander than its predecessor. The oak larder provides an inexhaustible supply of tea, milk, eggs and flour. It is also one of the favorite items to build for gaining Construction levels, with many people citing it as the thing that they power-built until they were able to make oak dungeon doors at level 74. By placing a log inside your stone fireplace, a tinderbox can be used to light a roaring fire. The stone fireplace is viewed by some as one of the great ways of cheaply gaining experience in the Construction skill. Though it gives only 40xp, the limestone may be mined then shaped into bricks completely free of charge. The limestone mine is up a trackway on the road from Varrock to Pasternoster, near to the Rag and Bone Man. Once mined, use a chisel on it to create the brick. You now have the Construction level to do Cold War. The rewards include 1.5k Construction xp and the ability to craft a Penguin suit in your workshop. In the kitchen, the steel range can be used to cook all food (as long as the player has the cooking level, obviously). The oak shelves 1 provide an inexhaustible supply of kettles, teapots, cups, beer glasses, cake tins and bowls. However, the tea from them causes a temporary boost of only one Construction level again. It is a personal decision whether the addition of bowls makes up for the loss of a two level boost. In the workshop, the previous crafting table does not need to be removed in order to upgrade it to the third version. As well as retaining the ability to make wooden horsies and cats, plus clockwork mechanisms, this crafting table allows the creation of clockwork soldiers and dolls. First create a clockwork mechanism, before right-clicking on the table. Choose the 'clockwork toys' option, then select which toy to make. Both the doll and soldier require a normal plank and a clockwork mechanism, plus level 18 Crafting. They can be wound up and set moving on the floor. An oak prize chest can be added to the Games Room. Up to 500gp can be added to it as a prize for the winner of any of the activities in there, though this can only be competed for if the owner of the house initiates the game. The winner will receive a key which opens the chest. In the combat room, that boxing ring can finally be used, as a glove rack can be built. It holds an inexhaustible supply of red and blue boxing gloves. You can now build a Quest Hall for 25,000gp. The materials given are for just one teak armchair, though you have three hotspots here. If you want all three to contain teak armchairs, then pack six teak planks instead. The teak armchairs may be sat upon. The teak decoration is purely decorative. The tool store 3 provides an inexhaustible supply of brown aprons, glassblowing pipes and needles. It appears alongside earlier tool stores, which do not need to be removed to accommodate this. Occasionally, during the stress of combat, arrows and staves can become bent or broken. The whetstone provides a place to fix them, as well as sharpening rusty swords. The Falador Herald will only sell portraits if the required quest has been completed. Choose from 'The Giant Dwarf' for the Giant Dwarf portrait, 'Biohazard' for the Elena portrait or 'Merlin's Crystal' for the King Arthur portrait. Once installed in your house, they are purely decorative. Dragon Bitter can be bought from the pub in Yanille for 2gp each. Alternatively, with level 39 cooking, it may be brewed using four Krandorian Hops. It adds 2 points to strength, but takes 3 points from attack. An over-sized bass is a rare and random find when fishing for ordinary bass. If you are lucky enough to find one then it can be stuffed at the taxidermist in Canifis. The bell-pull is used to summon the servant, if one has been hired. This is useful as, though the servant will always remain on the same floor as the house owner, (s)he does move around and can be sometimes difficult to locate in a large house. Its function is no different to the preceding rope bell-pull, it just looks more grand. The oak dresser offers a free choice of eight beard types for male players, while female players receive a free choice of seven hairstyles. In the games room, the magical balance allows for a magic-based competition between an unlimited number of players, with an automatic announcement of the winner. Different spells cause the activated orb to change color with the winner being the one to place it in balance. Further details are available in the Games Book in your bookcase. Only one bench is made at a time, so if you wish to have teak benches on either side of your dining table, multiply the materials/xp/costs by two. Up to eight people can sit on the benches around the teak dining table. This use doesn't change, though the later dining table and benches became increasingly more elegant and expensive. In the Skill Hall, a conversation can be held with a stuffed head, while the map is purely decorative. The hand or heads are rare and random drops found when killing the Crawling Head, Cockatrice or Basilisk. This can then be taken to the taxidermist in Canifis to be stuffed, before using on this hotspot. The oak wardrobe allows a free change of default shoes, sleeves and/or hand type for any player with access to the house. The attack stone is used in competitions between any number of people, who take it in turns to hit it. There is an automatic announcement of the name of the person who shatters it. The Jester game is very similar to the mime random event. The winner is the first person to successfully copy the actions of the Jester. Further details are available in the Games Book in your bookcase. You can now build a Study for 50,000gp. You also have the option to redecorate in the 'tropical wood' design, as seen in Ardougne and Karamja buildings. This costs 15,000gp and can be bought from an Estate Agent. While you are there, you may wish to move your home. At this level, there is an option to move it to Brimhaven for 15,000gp. As well as providing access to the jungle lands, it's also a favorite with farmers. Several pineapple trees grow wild just to the south, which allows for swift supercompost harvesting. You can hire a faster servant, the Butler. The opulent curtains are purely decorative, though they look better quality than the preceding curtains. Using them on one window will result in all windows in that room being fitted with curtains. If a curtain hotspot exists on a connecting wall, without a window, there will appear a wooden decoration instead. The oak lectern provides the facility to create teletabs: enchant sapphire and Varrock teleport. Either earth rune, air rune, fire rune and water rune; or body rune, cosmic rune, chaos rune and nature rune. Rune case 1 requires level 41 Runecrafting, while rune case 2 requires level 44 Runecrafting. Both it and the globe are decorative. The Fencing Ring allows players to fight with swords, but only the wooden versions available in the weapons rack. They all need to strip off to their default clothing and be wielding no weapons, but those provided in the rack. Even jewelry is taboo. NB This is a safe area, insofar as dying will result in the player respawning somewhere in the house with all of their belongings intact. The shield easel, in the workshop, can be used to paint steel or rune full helms and kiteshields with family crest colors Anyone can do this, using your pluming stand, though it should be noted that painted items become untradeable. You can now build a Costume Room for 50,000gp. In the kitchen, the fancy range can be used to cook all food (as long as the player has the cooking level, obviously). In the workshop, the previous crafting table does not need to be removed in order to upgrade it to the third version. As well as retaining the ability to make wooden horsies and cats, plus clockwork mechanisms, this crafting table adds to the soldier and doll with more clockwork toys to be crafted in the shape of mice and cats. During the 'Cold War' quest, the ability to make clockwork penguins is also available. First create a clockwork mechanism, before right-clicking on the table. Choose the 'clockwork toys' option, then select which toy to make. As with the soldier and doll, a normal plank and a clockwork mechanism is required, with the mice requiring level 33 crafting, the cat level 85 Crafting and the penguin level 30 Crafting. The penguin also requires a piece of silk, alongside the usual materials. The mice can be chased for agility experience; while the cat will follow like a living feline, but cannot chase vermin etc. The Study's crystal ball can be used to change elemental staffs. For example, use an air staff on it and a menu pops up with the option to change it to fire, earth or water. In the costume room, the oak wardrobe will allow storage of one set of mage robes or armour. The exceptions are blue or black wizard robes, which cannot be hung up here. The mounted swords are purely decorative, though are returned if there is a need to remove them. The teak larder provides an inexhaustible supply of tea, milk, eggs, flour, potatoes, garlic, onions and cheese. The downside is that its construction removes the option of building oak larders for power-leveling (unless a second kitchen is built solely for leveling, or the builder occasionally just tears down the teak larder to gain some levels before putting it back). The alchemical chart is purely decorative. The oak fancy dress box allows the storage of two items from the costume box list. The tool store 4 provides an inexhaustible supply of crafting moulds: bracelet, amulet, necklace, ring, holy symbol and tiara. It appears alongside earlier tool stores, which do not need to be removed to accommodate this. A teak prize chest can be added to the Games Room. Up to 1,000gp can be added to it as a prize for the winner of any of the activities in there, though this can only be competed for if the owner of the house initiates the game. The winner will receive a key which opens the chest. In the combat room, the weapons rack can be upgraded to hold an inexhaustible supply of red and blue boxing gloves, wooden swords and wooden shields. The landscapes are purely decorative. The wooden telescope is largely ornamental, though your person does gaze into it and apparently does see stars. 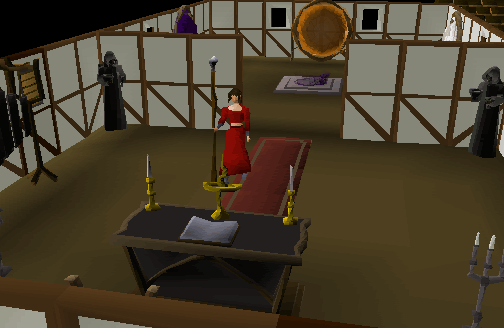 You can now build a Chapel for 50,000gp. Your house dimensions may now be 6 by 6. The oak shelves 2 provide an inexhaustible supply of kettles, teapots, cups, beer glasses, cake tins, bowls and pie dishes. The tea from them causes a temporary boost of two Construction levels again, so is much more valuable to the builder than the oak shelves 1. Up to eight people can sit on the benches around the carved teak dining table. This use doesn't change, though the later dining table and benches became increasingly more elegant and expensive. The oak altar can be used to recharge prayer. Bones can be used on it for extra prayer experience than would be gained by simply burying them. Check the prayer chart for more information. At this level, the torches are purely decorative. The steel-framed workbench allows the builder to create flatpacked items up to level 60 Construction. Furniture made in this way can be carried outside of the house and traded, though not everything can be flatpacked. As the workbench can be used without building mode being switched on, this is the location where the 'assist' system may be used. Anyone can use this workbench, as long as they have access to the house. For more information about flatpacks, see the notes at level 17. The teak dresser offers a free choice of eight beard types and/or four hairstyles for male players, while female players receive a free choice of nine hairstyles. The oak armour case holds two sets from those listed under 'armor case'. The Eagle lectern provides the facility to create teletabs: enchant sapphire and Varrock, Falador and Lumbridge teleports. The Demon lectern provides the facility to create teletabs: enchant sapphire or emerald, Varrock teleports, and bones to bananas. The sink provides a source of water in the house, handy for filling the kettle, making soft clay and cooking. The Anti-dragonbreath shield and Cape of Legends are purely decorative, but the mounted Amulet of Glory will provide unlimited teleportation to Edgeville, Draynor Village, Al-Kharid and Karamja. The Chef's Delight barrel has an unlimited supply of Chef's Delight on tap, though beer glasses filled in a player-owned house cannot be taken outside it. Use the brewing guide for instructions on how to brew ale to build this barrel; it cannot be bought from a pub, though can be potential loot from a Gourmet Impling. It raises cooking by 1-5 levels, depending upon the player's cooking level, whilst reducing attack and strength both by 1-2 levels. It also heals 10 Life Points. The oak treasure chest holds level one Treasure Trail awards. See the full list of these under 'treasure chest'. The symbol consecrates your chapel, dedicating it to your chosen god. The staircase may now be upgraded to the better quality teak. However, extreme caution should be applied when removing staircases. There have been many reports of players permanently losing whole floors, including all rooms and furniture, because access to them has been temporarily removed. To be safe, always ensure that there is a secondary access, ie another staircase or ladder elsewhere in the house, before removing staircases. For further information, see the notes at level 78. Only one teak staircase needs to be created in this hotspot. It will automatically create the staircase in the room above. The Treasure Hunt game releases a fairy, who hides somewhere in your home. Each person automatically receives a stone, which can be rubbed to determine if this location is 'hot' or 'cold' in relation to her hiding place. The winner is the person who finds her. Further details are available in the Games Book in your bookcase. At this level, the chapel torches, window shutters and statues are purely decorative. The windchimes can be played though. You can now build a Portal Chamber for 100,000gp. The portals may be directed to one of seven locations, supplying a permanent link between your house and this destination. Clicking on the teleport focus will produce the options for directing them. The required runes are listed here. The magic level to ordinarily cast these teleport spells doesn't appear to be needed, but there are some quest limitations. The Ardougne portal is reliant upon having completed the Plague City quest; the Watchtower portal on completion of the Watchtower quest; and the Kharyll portal on finishing 'Desert Treasure'. As each portal chamber has the capacity for only three portals, their direction requires some thought. Consideration might be given to the Varrock portal, as it is home to both the sawmill and the Grand Exchange, both sources for Construction materials. The Kharyll (Canifis) portal is also useful, both for its proximity to a bank and for the fact that it is the only teleport ordinarily only available with the ancient magic spellbook. The teak altar can be used to recharge prayer. Bones can be used on it for extra prayer experience than would be gained by simply burying them. Check the prayer chart for more information. The mahogany armchairs may be sat upon. The oak toy box will hold every item from the list under 'toy box'. These are basically things gained from holiday events. The ornamental globe is purely decorative. You have the option to redecorate in the 'fancy stone' design, as seen in Falador buildings, and is the highest level house style possible. This costs 25,000gp and can be bought from an Estate Agent. While you are there, you may wish to move your home. At this level, there is an option to move it to Yanille for 25,000gp. Many higher level Construction workers live in Yanille, because it affords the closest proximity to a bank of all the locations on offer. By now, houses may contain the mounted glory and portal chambers to allow access to everywhere else. Also at level 50, you get an extra room entitlement. Your house can contain 21 rooms at this level. You can hire a faster servant, Alathazdrar, the Demon Butler.